Eye exams (視力検査, shiryoku kensa) in Japan are pretty similar to those of other countries. You get them as part of a general physical check-up at the doctor's office and when you renew your driver's license. The only thing that caught me off guard about eye exams here is the difference in design. In the US, I was used to naming alphabet letters (a Snellen chart). However, sometimes I would be presented with a chart of "E"s pointing in different directions and asked to point my hand in the corresponding direction (an E chart). That second test is similar to the eye exams used most commonly in Japan. 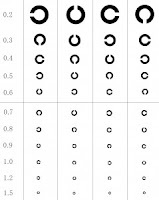 However, instead of "E"s, the Japanese chart uses circles with little sections cut out of them. When taking the exam, patients are asked to name which part of the circle is missing, using 上 (ue, up), 下 (shita, down), 右 (migi, right), and 左 (hidari, left). If your Japanese isn't up to snuff, don't worry: The test is well-suited for patients with insufficient language skills (including little children). The examiner will likely have you point your finger in the direction of the opening instead. 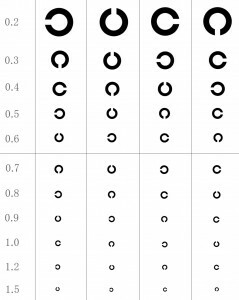 By the way, this test is known as a "Landolt C", named after its Swiss/French inventor, and it is also widely used for eye exams in mainland Europe. The test can include some trick questions, such as "C"s with diagonal openings. I've only encountered ones like these in optometrist offices, though, not in driving tests or general checkups. Other Japanese eye exams using hiragana or katakana do exist. Like alphabet letters in the west, patients are presented with a list of, say, hiragana characters and asked to name them one at a time. For some patients, such as the elderly patient in this amusing anecdote, the hiragana tests appear more logical than the Landolt C, and sometimes in Japan you'll see charts with a few different kinds of tests printed alongside each other. As another somewhat related aside, colorblindness appears to be less prevalent in Japan than in the US and parts of Europe. I've heard statistics as high as 7.5% for males in the US, and the Japanese Wikipedia page states that about 4.5% of Japanese males are affected by red-green colorblindness. 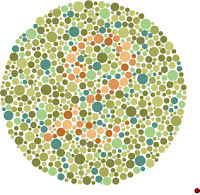 Interestingly, the most common test used to diagnose colorblindness, the Ishihara Color Test, hails from Japan. 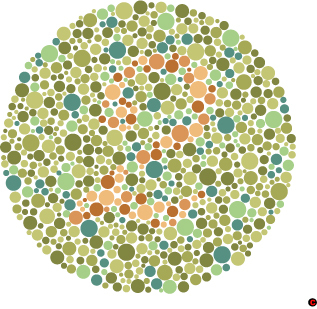 My personal interest in this comes from a commotion I caused when I got slightly too many answers wrong on a colorblindness test during a physical checkup in Japan. I'd never been diagnosed as colorblind in the US, but the Japanese nurse performing that particular check pulled out a large, dusty book of more problems to check for colorblindness after my mediocre performance. At the end of the second test, she insisted that I have a very slight color vision deficiency. Not enough to fit into the "normal vision" or two grades of colorblindness that were on the hospital's checkup form, though, because she ended up checking "normal vision" and making a lengthy note to the side about how I was only unable to answer correctly when presented with certain, very specific problems. Anyway, I have normal enough color vision to be fascinated by pages like this. Incidentally, the first problems I took during that Ishihara test were hiragana problems, where the patient appears to see a, say, よ instead of a ま or a は if a color vision deficiency is present. The second, dusty book of problems used numbers like the American tests I was used to. This was very helpful. I have 4 Japanese clients who will be having their eye exams soon. It's good to know beforehand what they are already used to. I expect the Snellen test to be entertaining, since in Spanish "E" is read as "eh" which sounds like Japanese "eh" for English "A", but I can bet they'll read the letter "E" in English as "ee" (like in "eek") which in Spanish is the reading for "I". The Ishihara test should make them relax, though.